Hot on the heels of yesterdays first Ramen Resolution posts, Adam and I hit up Lingo for our second helping. Yet again, I was late and Adam had nabbed a table for some pre-theatre noodles. As we passed the restaurant a week or so ago it was clear this would be a more authentic Japanese experience. If it seems like a good time to share this clip from Tampopo: A Lesson in Ramen. To further add to our authentic experience we decided ordered sake (which tastes far better served ice cold). An unexpected surprise was the complimentary salad, with it’s delicious dressing. Adam very nearly upset Anglo-Japanese relations suggesting the sauce contains sarin (he meant mirin!). To start I opted for the Chicken Gyoza and he chose the deep fried octopus dish Tako Karaage (in order to compare with that offered by YoSushi! – find out what he thought in his blog). These are fresh-tasting real-deal gyoza, not the sticky sweet version you get in Wagamamma. I didn’t really like the octopus, which was oddly stringy and hard to swallow. Steaming bowls of ramen arrived. My pork variety was lovely – light broth and slightly metallic sea vegetables. The yolk of the egg was a little too overcooked, but shredded beansprouts and moist char siu made up for that. The only problem was that the spoon (rather than more traditional ladle) was too shallow to get at all the soup! Coming in at a total of £49 this instinctively felt more affordable than Shoryu, but when I think about it, it’s not much different! If I had to find fault with Lingo it would be that the service felt rushed. I was still chasing a cherry tomato around a plate with chopsticks when the starters arrived. All things considered I really enjoyed Lingo, so this sounds like a cop out but it’s another RAMEN (or ★★★☆☆). So there we have it. 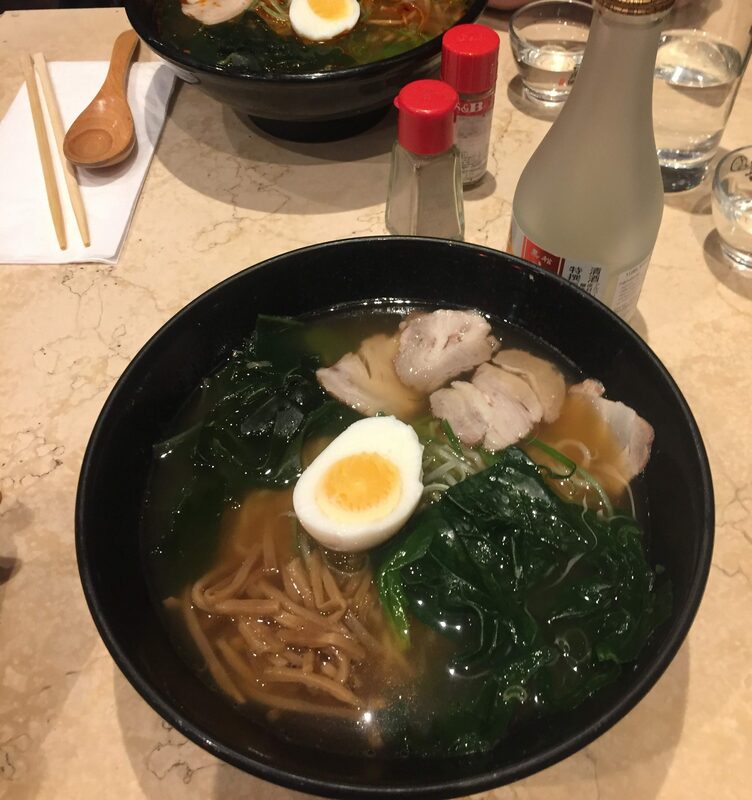 We don’t currently have a plan for where to head next so let us know if you’ve got a #RamenRecommendation on twitter @mtthwhgn and @InaneAdam. By 1673 the stretch of land north of Piccadilly Circus was under the joint ownership of brothers John and James Baker. Halfway through their original plan of redeveloping the Golden Square area they had a falling out and the streets leading to the new square were developed separately. This is reflected in the names of Upper and Lower John Street (on which Lingo is located) and Upper and Lower James Streets.